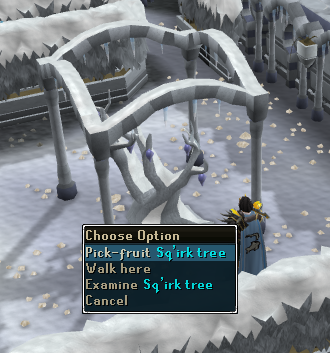 Speak to Leela, who can be found near Draynor Village. To start this quest, you will need to speak with Leela, who is located in Draynor Village. She can be found wandering around somewhere northwest of the jail. 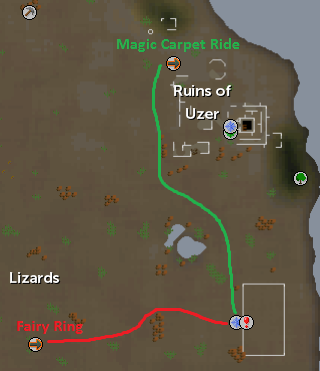 To get to Leela, teleport to the Draynor Lodestone and walk south or cabbage-port with the explorer's ring and walk southeast. Alternatively, teleport to the Lumbridge lodestone and walk west. Leela will ask you to check out the pyramid south of Uzer, and contact the mummy who is inside it. To get there, you can either use the Fairy Ring and go east (Code D-L-Q), or you can go to Shantay Pass. Teleport to the Al Kharid lodestone or use a Ring of Duelling to teleport to the Duel Arena and walk south. Make sure you have things to help survive in the desert (like waterskins/enchanted water tiara and desert robes), some armour and a weapon, some coins (at least 200), and a teleport to anywhere. Now enter the gates and take the carpet ride to Uzer. Once in Uzer, head south to find the pyramid. There will be two small rooms at the start; enter the one that has a cave leading off of it. You will see a skeleton on the ground. Right-click and rummage it. Now return to Leela with your newly obtained items. Leela will take interest in the Scroll of the Dead that you obtained. After reading it, she will ask that you reconstruct the mummy inside the pyramid. To start, head to Ali Morrisane, who is in northern Al Kharid (at the quest symbol to the east of the Gnome Glider). To get there you can teleport to the Al Kharid lodestone and head north or use a Ring of Duelling. You will need to talk to him about the ways you can contact the mummy in the pyramid. He will tell you that he does have a copy of Senliten's official name. Unfortunately, he will only give it to you if you get him a glass of sq'irk juice. To get the juice, head south to the little house and right click teleport on the apprentice. You should now be in the Sorceress's Garden Activity. Go to any season and obtain enough fruit of the same season to make sq'irk juice. This will take 5 fruit from the Winter Garden, 4 from Spring, 3 from Autumn, or 2 from Summer. Now use your pestle and mortar on the fruit while you have an empty beer glass in your inventory. You will now have the juice, which you need to take to Ali Morrisane. Give the juice to Ali and he will give you a "Copied Name" scroll. When you read it, you'll notice that he made errors while copying it. Equip your Ring of Charos (a) and speak to him again. You will get the actual scroll. 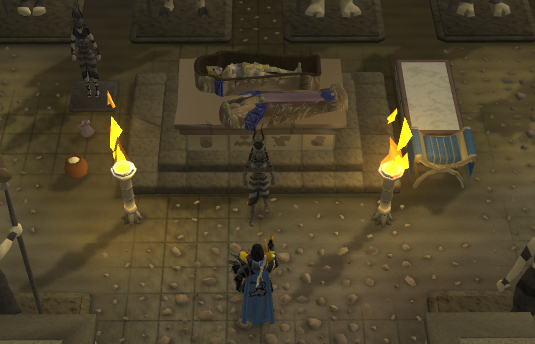 Now, head to the Varrock library. To get there, head to the bank at Shantay Pass or the one in Al Kharid and grab a teleport. 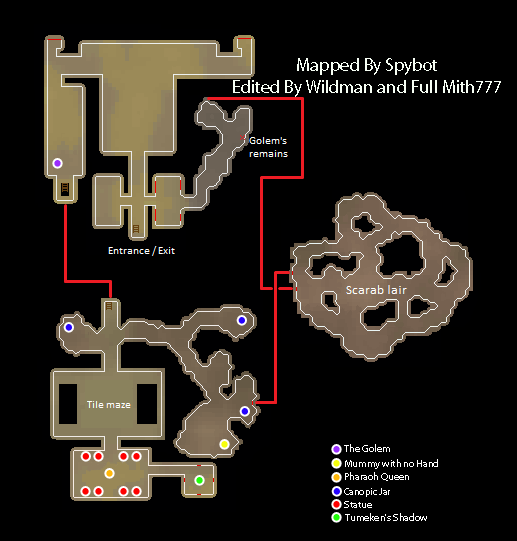 Or you could simply walk there, which may be more convenient because you can grab an Al Kharid flier on the way which you will need later on in the quest. 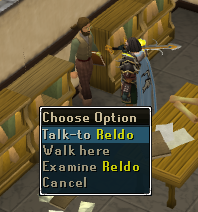 Once at the library, speak with Reldo. Ask him about the pyramid, however, he will tell you he needs an Al Kharid flier to copy the documents. You can get one of these from the boy north of the mining pit in Al Kharid near the gate at the north of the desert. Once you give Reldo the flier he will give you the Scroll of Praise. Now head back to Al Kharid and get your desert gear and items ready. Make sure you have armour, weapon, food, knife, a willow log, 20 Fire runes, wine, spice, grain, pot, hammer, and a saw. Also, before you leave, make sure you put the spice in your jug of wine and the grain in your empty pot. Finally, head back to the pyramid by taking the carpet to Uzer and traveling south. Go inside the pyramid and head to the imposing doors. You will see a golem. Try going down the stairs, the golem won't allow you. You have to attack it and kill it. Once this is done, procede. Now go down the stairs and pick up the one jar to the west. Now head east past a few level 60 scarabs to pick up two more Canopic Jars and a mummy with no hands which you should combine with the mummy's hand, then head back south of the staircase to find a puzzle. The puzzle is totally random for each person and will change each time you enter the temple. Stepping from green to red, red to blue, yellow to green, or blue to yellow tiles will trigger a trap which can hit over 200 Life Points, so it is suggested that you cross by following either a path of red and yellow tiles or a path of blue and green tiles. After you're across, head to the room with sarcophagus and start repairing. Repair all the statues. While you lose prayer doing this, you can also pray at those which have been fixed to recover prayer points. Replace the broken jug with your spiced wine. Replace the broken pot with your pot of flour next to the wine. Fix the statue by using a knife and willow log. Try it a few times until you receive the clarification that it is complete. Some of the tasks do not have to be totally completed in order to reach 75% completion. After you've done a good portion of the tasks above, head east and kill the first Tumeken's Shadow. Then light the one of the torches, which is done with fire runes (the torches are lit in a random order for everyone, keep trying to light them until it works). The next shadow will appear and be a bit higher level. Kill it and light another torch. Do this with the last two torches, and kill the shadows which have levels up to 70. Now go back to the earlier room and have a chat with the queen. You can also give her the two scrolls you earned earlier from Reldo and Ali to gain some completion. After talking, ensure that your progress is at least 75% by checking your quest journal or the scroll of the dead then go back to Leela in Draynor Village and speak with her. There are 25 tasks in all, each task is 4% of completion, and they don't have to be done in the exact order listed. 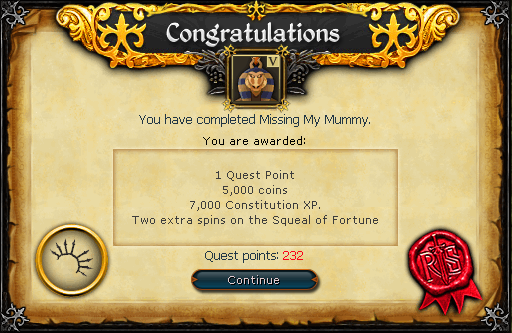 You can go for the full 100% while doing the quest, or return whenever you like to complete any additional task(s). However, you need to speak to the Queen in order to do the improvements to her Body Double statue, and she can't talk to you until you've reached a high enough level of completion. The game chat will notify you when you get to that point. Also, when you talk to her, choosing all available chat options will give you some interesting history and background information. Give Copied Name papyrus to the Queen. Give Mummy's Name papyrus to the Queen. Note: Lighting the torches for 3, 4, and 5 require successively higher Magic levels. (3-6) Each canopic jar = one step. Replace the pot of grain and the spiced wine - gives 2,100 Cooking XP. 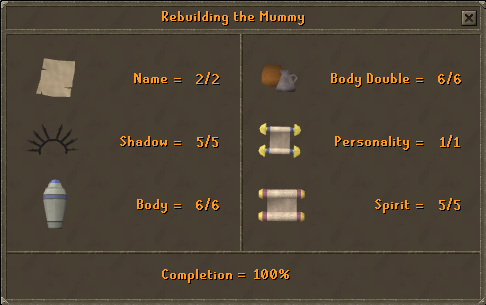 Build the queen's statue - gives 450 Crafting XP. After talking to the Queen, improve the statue's appearance - gives 900 Crafting XP. Note: Does not give direct XP. 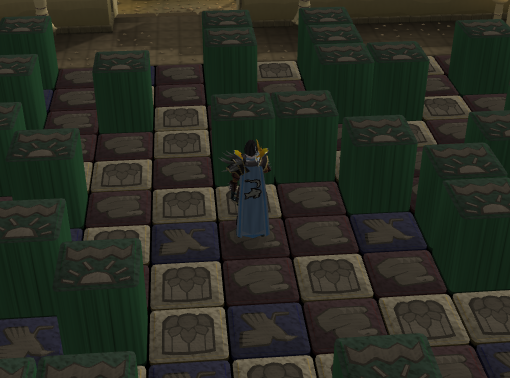 (1-5) Each statue you raise is one step - gives 6,500 Prayer XP if you raise all 5. [^] Go to Pyramid and enter it. [^] Rummage, then kill 'Skeleton Looters' and pick up required items. [^] Talk to Ali Morrisane. [^] Make Sq'irk Juice and give it to Ali. [^] Equip Ring of Charos(a) and talk to him again. [^] Go back to the Pyramid. [^] Pick up the 3 Canopic Jars and the Mummy with no hands. [^] Pass the floor puzzle. [^] Fix chair, table and statues. [^] Place jars on the shelf and replace the broken wine jar. [^] Fix the broken pot and create the statue. [^] Kill all 5 variants of Tumeken's Shadow. [^] Speak to the Queen.